Beyond building dynamic and powerful mental maps with Happy Brain, new thought forms often emerge through the clients’ expanding consciousness and patterns of transformation. Somehow the mind’s deeper structures facilitate connection to something higher than self and sometimes unexplainable. Children explain it as magic; adults tend to search for academic answers or connect to their spiritually developing selves. 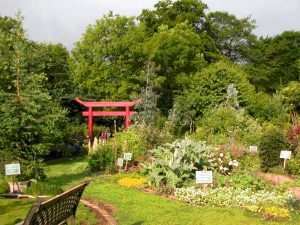 In a continued search for more ways to answer questions about this phenomenon, Kay Cooke formed a friendship and working relationship with Professor Emiritus Elaine Perry (neuroscience and pharmacognosy), who owns and runs an educational charity in the form of the Dilston physic garden. Steeped in herbal medicine and clinical research, this botanical haven immerses its visitors in historical contexts that depict the origins of western (and some global) medicines, expressed through the ages as magical tales, folklore, and art. It is a perfect environment in which to experience the juxtaposition of many (often opposing) traditions, and be clear that magic is only what science has not yet been able to explain. For centuries, folklore was the conduit of magical healing practices, and today, finally, science is catching up with and can prove valid, what our ancestors have known for centuries. Kay regularly utilises this environment where the healing essence of nature can be overtly or covertly utilised. Transformation can be explained through magic or through science. The models are uniquely accessible to fit whichever level of consciousness it lands upon; perhaps communicating with plant spirits of say, a plant like foxglove, or understanding the pharmacology – the drug digoxin originates in the plant. And so we will explore some 21st century science that had its roots in the magical knowledge of an old crone. Today, Saint John’s Wort is widely accepted as an antidepressant herbal medicine with many clinical trials indicating it as effective as antidepressant drugs like prozac for mild to moderate depression, but without the side-effects. This workshop will connect Happy Brain principles to historical folkore, magical practices, and facts present through leading edge neuroscience.